Every now and then we come across an item that is truly rare and unique, an undeniable treasure of which only a handful exist. Upon first glance, this coffee spoon looks pretty but not terribly unusual. However, when you look closer, its amazing background is revealed: the spoon is aluminum, not sterling silver, and bears a unique hallmark. 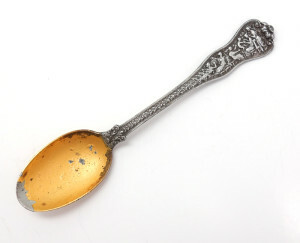 This antique aluminum coffee spoon was crafted by the noted New York firm Tiffany & Co. The spoon was part of a set of twelve created for display at the 1893 World’s Columbian Exposition in Chicago. The spoon handle is Tiffany’s elegant Olympian pattern (Bacchantes amusing the infant motif). The standard Tiffany & Co hallmark is accompanied by an unusual hallmark of a “T” through a globe. This hallmark was used by Tiffany & Co only on items specifically made for the Columbian Exposition. Throughout the entirety of its storied past, Tiffany has made only twelve spoons in aluminum, and this amazingly rare find is one of them. 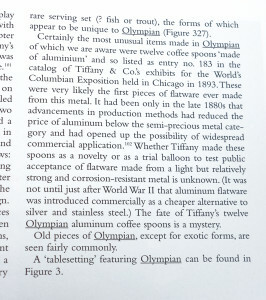 A passage concerning the history of the spoons can be found on page 217 of “Tiffany Silver Flatware 1845-1905, When Dining Was an Art” by William P. Hood Jr. with Roslyn Berlin and Edward Wawrynek. Published in 1999 by the Antique Collectors’ Club Ltd., Woodbridge, Suffolk. This extraordinary find came out of an upstate New York estate and is an amazing example of the incredibly rare things you can discover if you keep your eyes open. The knowledge that this is a unique piece of flatware, one of only twelve in the entire world, is quite spectacular. Take a closer look at this one-of-a-kind piece by visiting our store. Are you interested in learning more about the 1893 Columbian Exposition? Read more about it here, or try The Devil in the White City by Erik Larson for a fascinating glimpse into the dizzying heights of creation and human achievement of the World’s Fair, contrasted sharply with the depths of humanity’s dark side. Are you looking for more interesting estate discoveries, antiques, silver, jewelry, or collectibles? Explore the Nine Caroline Antiques store.